River landscapes have served as areas for settlements, infrastructure, and production for several thousand years. They provide water for drinking, cooling, and irrigation, fish as food supply or for recreational fishing, and areas for flood protection, and they can have cultural and esthetic value. The increasing intensification of land use and the associated channelization, damming, and other radical changes (e.g., through operation of hydropower plants) led to a shift of the functions and related services available in river landscapes. To counteract this trend, one first step is to enhance public awareness of their importance. 21.1 What Are Ecosystem Services? River landscapes have served as areas for settlements, infrastructure, and production for several thousand years. They provide water for drinking, cooling, and irrigation, fish as food supply or for recreational fishing, areas for flood protection, and they can have cultural and esthetic value. The increasing intensification of land use and the associated channelization, damming, and other radical changes (e.g., through operation of hydropower plants) led to a shift of the functions and related services available in river landscapes. To counteract this trend, one first step is to enhance public awareness of their importance. One possible way to raise awareness about the importance of unimpaired river landscapes for the provision of services and to consider them more easily within decision-making processes is the ecosystem services (ES) concept. This concept highlights the relationship between different influences on ecosystems and the availability of their functions as they relate to provision of services for humans. Ecosystem services refer to the interface between ecosystems and human well-being and are described as the many different benefits ecosystems provide to people (MEA 2003). The cascade model originally published by Haines-Young and Potschin (2010) is used as a basis in many studies dealing with the ES concept. It distinguishes between ecological structures, processes, and benefits that humans derive from ecosystems (Fig. 21.1). While ecosystem functions describe the capacity to provide goods or services for human society, the extent of ES and consequently the benefit for humans are determined by the actual demand. Originating in the 1970s, the ES concept became an issue in the international environmental discussions in the 1990s. Since then its influence has continued to rise. An important milestone was Robert Costanza’s publication on the value of world’s natural capital and ES that calculated the total value of world’s ES with $16–$54 trillion per year (Costanza et al. 1997). A more recent publication by Costanza et al. (2014) gives an updated estimate for the total global ES in 2011 of $125 trillion per year. Other important steps were the Millennium Ecosystem Assessment (MEA 2003) that assessed the consequences of ecosystem change for human well-being, the TEEB initiative (TEEB 2010) that highlighted the global economic benefits of biodiversity, and the establishment of the Intergovernmental Science-Policy Platform on Biodiversity and Ecosystem Services (IPBES 2015) that acts as an interface between scientists and policy-makers. Furthermore, the Convention on Biological Diversity (CBD 2010) has a strong focus on ES and includes this issue as one of its strategic goals. A comprehensive review on the history of the ES concept is given by Gómez-Baggethun et al. (2010). In the field of landscape planning, the ES approach is comparable with the idea of “landscape functionality” that has already been an issue for decades (Kienast 2010; Von Haaren and Albert 2011; Grunewald and Bastian 2013). Although this concept overlaps to a certain extent with the understanding of ES, many open questions remain before the ES concept is fully integrated in landscape research and decision-making (Hermann et al. 2014). Within the scientific debate, also another term—the so-called ecosystem disservices—is discussed. This describes the negative values of ecosystems such as diseases, parasites, predators, or certain insects that are often overlooked in valuation attempts of ES (Dunn 2010). In the context of river landscape management, the ecosystem disservice “flooding” is of specific importance. While flooding also provides valuable services, such as supporting fish nurseries in the floodplain or storing water in the floodplain and the aquifer, especially in areas where people settled or built too close to water bodies or in previous floodplains, flood events are considered as “bads” (Nedkov and Burkhard 2012). However, there is often little awareness of the fact that many of these disservices are actually caused by human activities in the first place. Although the ES concept is highly popular in the scientific realm and is discussed in countless research articles and policy papers, its application in practice lags behind (Portman 2013; Hauck et al. 2013; Albert et al. 2014). One reason for this research-practice gap is seen in the lack of any guidance for policy-makers to define, measure, and value ES and to integrate them in policy and governance (Bouma and van Beukering 2015). This points to the need for more direct science-policy interaction between researchers and stakeholders and a better communication to stakeholders and the public (Neßhöver et al. 2013; de Groot et al. 2010). Also, Böck et al. (2015) found that many stakeholders detected a certain redundancy between the ES concept and already existing guidelines and legal frameworks. Adding ES rather seemed like an additional instead of a reduced workload. Despite these limitations, the ES concept can be very useful and offers many potential areas of application. They include (1) raising awareness about the importance of conserving ecosystems and their biodiversity; (2) understanding their significance in relation to human activities and well-being; (3) providing a new communication framework between policy-makers, scientists, and the public on nature and society interlinkages; and (4) promoting the idea that maintaining natural capital through conservation and restoration will help sustain the provision of ES that we depend on (Wallis et al. 2011). It can also be helpful in the course of the evaluation of restoration projects to examine the effect of restoration on biodiversity and consequently the provision of ES (Rey Benayas et al. 2009). The increasing consumption of natural resources and the related loss of biodiversity are often used as an argument for the valuation of ES. Thereby, their visibility and their consideration in political and economic decision-making processes can be improved (Schwaiger et al. 2015). Several quantitative and qualitative, monetary and nonmonetary, assessment methods and techniques have been developed to systematically assess the multitude of ES and the importance of biodiversity (Schröter-Schlaack et al. 2014). In addition to these newly developed approaches, already existing methods for data collection and assessment are also used for ES studies. This includes mapping and monitoring activities, (expert) interviews, or statistical analyses (Grunewald and Bastian 2013). Deciding on the most suitable assessment method depends on the research question and the assessment goal. Such a decision may hinge on the fact that the range of ES that can be assessed in monetary terms is rather small in comparison to the larger number of ES that can only be assessed qualitatively. From the full range of ES, a large part can be assessed qualitatively, a smaller part can be assessed quantitatively, and even smaller parts can be assessed in monetary terms. In particular, cultural ES are often given less consideration in quantitative and monetary assessments as their classification and measuring are difficult (Satz et al. 2013). To ensure a representative picture, we need to combine monetary with other quantitative and qualitative assessments (ten Brink and Bräuer 2008). Therefore, Häyhä and Franzese (2014) suggest an interdisciplinary and system perspective for ES assessments to avoid partially informed decisions and a consequent mismanagement of natural resources. Also Kumar and Kumar (2008) and Gómez-Baggethun et al. (2014) point to the need for integrated assessment approaches that also consider the social and ecological aspects of ecosystem service values. This need has already been considered by several recent initiatives such as the MEA, the TEEB initiative, or the IPBES framework (Kelemen et al. 2014). Several researchers point to the need of not only considering the utilitarian value of ecosystems for humans but also bearing in mind that ecosystems can also have intrinsic values, irrespective of their utility for human well-being (MEA 2005). Already in the past, several researchers questioned whether a human-centered utilitarian perspective is sufficient to protect the environment or whether it is necessary to consider the needs of the environment apart from its usefulness to humans (Seligman 1989). Giddings et al. (2002) raised the question of how money can compensate a tree for acid rain or an animal for its loss of habitat. It also needs to be considered that people are not only utility maximizers or satisficers but have several other conflicting objectives (reciprocity, relational and ecological identity and similar processes) that influence decision-making processes (Kumar and Kumar 2008). Gómez-Baggethun et al. (2010) discuss the uncertainties of the side effects of mainstreaming market-based conservation approaches in terms of possible changes in people’s motivation for conservation as well as in their human-nature relationship. It should be noted here that evaluation and assessment approaches are not limited to applications within the specific context of the ES concept. Even though many recent studies focus on the valuation of the benefits humans derive from ecosystems, the valuation approach itself can be also applied to other aspects of nature, such as whole ecosystems, individual species, or habitats. Ecological valuation methods, for instance, usually value ecosystems, rather than ES (Kronenberg and Andersson 2016). The approach of assessing nature is also important in the field of biomonitoring and bioassessment (see Chap. 19). The monetary evaluation of ES is seen particularly critically by various authors (e.g., de Groot et al. 2010; Kosoy and Corbera 2010; Spash 2008). They highlight technical difficulties and ethical implications. Norgaard (2010), for instance, argues that “the metaphor of nature as a stock that provides a flow of services” is not sufficient to face today’s challenges but can only work as part of a larger solution. Also a large share of interviewed stakeholders in a study of Böck et al. (2015) had a negative view toward a monetary ES assessment and voiced the fear of a commodification of nature. Additionality—Will it improve the environmental conditions at stake? Equality—Will it reduce inequalities and redistribute power? Complexity blinding—Will it suppress other valuations? Neoliberalism—Will it serve processes of enclosure of the commons? A large number of various valuation methods are available to estimate the value of different ES. This is because no single economic valuation technique is applicable to all ES, but the methods vary depending on the ES’ characteristics and data availability (DEFRA 2007). A basic distinction is made between market-based and nonmarket-based valuation methods (Fig. 21.2). The first method derives economic values from market prices, while in the second case, ES are valued indirectly via revealed preference methods. The most commonly applied (indirect) market valuation methods are the hedonic pricing and the travel cost method. The hedonic pricing method compares sales prices of two commodities (usually houses). The commodities need to be identical in most respects, except in regard to a certain environmental characteristic (e.g., traffic noise). The difference of the commodities’ sale prices can then be interpreted as a revealed “willingness to pay” for the ES, resulting in a price for the ES. The travel cost method observes the travel expenses (e.g., travel costs, time, admittance fees) of people visiting, for instance, a recreation site, which implicitly represent the economic value of the site (Koetse et al. 2015). If there is no market price available and the application of revealed preference methods is not possible, nonmarket valuation methods (i.e., stated preference methods) are used. The most important approaches in this context are the contingent valuation and the choice experiment method. In that case, surveys are used to ask people for their preferences for hypothetical changes in the provision of ES. Thereby, the values that people attach to them are estimated (DEFRA 2007). Two alternative methods are the meta-analysis and the value transfer. Although they are not valuation methods in themselves, they are relevant to mention as they are often used to derive ES values. Type of ecosystem good/service to be valued. Type of values—use values can be estimated by all valuation techniques, while nonuse values can only be estimated by the stated preference method. Because only a small part of nature’s services can actually be assessed in monetary terms (Fig. 21.2), there is a need for nonmonetary assessment approaches that also consider those services that are difficult to quantify. This is particularly the case for cultural services that are difficult to integrate in decision-making due to the challenge of assigning a monetary value to them (Chan et al. 2012). This can lead to a limited awareness of the variety of services that are provided by ecosystems and can be a challenge for mainstreaming ES across different societal actors (Martín-López et al. 2012). Although they are highly valued by different stakeholder groups, they are not reflected by economic indicators and therefore often sacrificed for economic or ecological reasons (Milcu et al. 2013; Chan et al. 2011). To address these services, sociocultural valuation approaches are increasingly gaining attention (Chan et al. 2006, 2012). These approaches consider services that are related to nonuse values, such as local identity or the intrinsic value of ecosystems, and cannot be addressed using economic techniques (Castro Martínez et al. 2013). They can be divided into qualitative and quantitative methods, both involving direct and indirect consultative methods (Fig. 21.3). Oteros-Rozas et al. (2014), for instance, describe a sociocultural valuation approach of ES that investigates people’s perceptions of the importance of ES in a cultural landscape. There are several other creative ideas from different researchers regarding nonmonetary assessment approaches. For instance, García-Llorente et al. (2016) suggest that to analyze the social support for biodiversity conservation activities and the related delivery of ES, one calculates the willingness to give up time. Kumar and Kumar (2008) point to the need of considering psychological and sociological aspects in ecosystem service valuation. They argue that there is a need for approaches that combine natural and social science research. An alternative to valuation that has become increasingly popular is the spatial representation of ES. This approach is often associated with participatory mapping- or photo-based methods (Milcu et al. 2013; Raymond et al. 2009; Eder and Arnberger 2016) and is also frequently combined with monetary and nonmonetary valuation methods. The approach of mapping ES has rapidly increased in the last years. It can be particularly helpful to identify highly valuable areas for conservation, ES’ supply and demand in a specific area, and trade-offs between different services (Chan et al. 2006; Häyhä and Franzese 2014). Mapping ES can visualize the effect of different management strategies on their supply and can therefore be a starting point for developing strategies for management and conservation (Naidoo et al. 2008). It is also very useful with regard to communication and visualization purposes and can thereby support decision-making processes (Alkemade et al. 2014), especially participatory science processes that involve scientists, policy-makers, and local practitioners. Verhagen et al. (2015) identified three main applications of ES maps, namely (1), the identification of “hotspots of change,” i.e., areas that need to be protected from changes that affect the service supply, (2) the visualization of trade-offs and synergies between ES, and (3) the active management of landscapes to “optimize ES to locations,” i.e., spatial configurations to optimize ES supply. Different authors have proposed a variety of approaches for mapping ES, including the use of biophysical metrics or monetary valuations (Häyhä and Franzese 2014). Martínez-Harms and Balvanera (2012) classify ES mapping approaches into three main approaches: (1) valuation of ES through benefit transfer (transferring the monetary value of a similar previous study to the current land cover map), (2) community value methods that integrate survey-based perceptions of place with biophysical data, and (3) different social-ecological assessment approaches that model the relationship between ecological and social variables to map ES supply. Which of the different proposed methods is applied depends on data availability, the scope of the study, and time constraints (Verhagen et al. 2015). Regulating services are the most commonly mapped group of ES. When looking at the individual services, carbon storage, carbon sequestration, food production, and recreation are most frequently studied (Martínez-Harms and Balvanera 2012). The InVEST-tool was developed within the frame of the Natural Capital Project (http://www.naturalcapitalproject.org/invest/). Analyses can be conducted at local, regional, or global scale. The results are either returned in biophysical or economic terms. The web-based ARIES (Artificial Intelligence for Ecosystem Services) technology (http://ariesonline.org/) combines a series of applications that assist in mapping ecosystem service provision, use, and benefit through utilizing GIS data from global through local scale. Remote sensing—Land use/land cover can be used as a proxy for quantifying and mapping ES. A review on relevant remote sensing approaches can be found in Ayanu et al. (2012). Polyscape—A GIS framework that is designed to explore spatially explicit synergies and trade-offs among ES to support landscape management (Jackson et al. 2013). The assessment of ES generally requires the identification and application of a suitable and comprehensive set of indicators. Indicators are variables that provide aggregated information on certain phenomena (Wiggering and Müller 2004), provide a means of measuring service provision (Norton et al. 2015), and serve as communication tools to simplify the complexity of human-environmental systems (Müller and Burkhard 2012). Heink and Kowarik (2010, p. 590) provide the following general definition: “An indicator in ecology and environmental planning is a component or a measure of environmentally relevant phenomena used to depict or evaluate environmental conditions or changes or to set environmental goals.” Some examples for indicators describing freshwater ES are the area occupied by riparian forests, the amount of fish produced (catch in tonnes by commercial and recreational fisheries), the ecological status of the water body in question, or the number of visitors to specific sites (Maes et al. 2016). When selecting indicators for an ES valuation, a careful and critical approach is essential. The framing and selection process not only defines what is being assessed (Hauck et al. 2015) but it also has significant influence on how the subsequent assessment can help policy- and decision-makers to take appropriate steps to counter undesirable ecosystem changes (Feld et al. 2010; Niemeijer and de Groot 2008). An important factor to consider when choosing ES indicators is practicability and, in this regard, especially data availability. Some authors argue to use indicators that can be described by data that was already collected for other purposes. Others say this approach focuses too much on the currently most visible and easily accessible services (Hauck et al. 2015) and at the same time causes other ES to recede from view and to be neglected in policy decisions (Heink et al. 2015; Maes et al. 2012). Another essential aspect of the indicator selection process is to make a distinction between potential and actual use of ES, because it results in different requirements for indicators. This circumstance is best explained with an example: When referring to the actual use of fish, one would choose a flow indicator (measured per unit of time) like tonnes of fish caught per year. When referring to the potential use of fish however, e.g., to find out about the reproductive potential of the fish population, a stock indicator (measured at a particular point in time) like the fish population size would be more suitable (Boyd and Banzhaf 2007). Wiggering and Müller (2004) provide a list of scientific- and management-related factors, which are relevant for successful indicator development, including, among others, a clear representation of the phenomenon of interest by the indicator, a clear proof of relevant cause-effect relations, a high degree of comparability in and with indicator sets, a good fulfillment of statistical requirements, a high political relevance concerning the decision process, a high comprehensibility and public transparency, a satisfying measurability, and a high degree of data availability. Keeping all these factors in mind, the indicator selection depends heavily on the specific context of application and the characteristics of the investigated ecosystem (Reyers et al. 2010; Fisher et al. 2009). The ES concept offers a number of potential applications in research as well as in the practice realm. In the following, the application of the ES concept is shown at the example of different case studies. An example of a project dealing with the quantification of ES is the EU-funded project REFORM (REstoring rivers FOR effective catchment Management) where, among many other issues, 20 pairs of restored and unrestored river reaches were investigated throughout Europe. The main project objective was to provide a framework for successful and cost-effective river restoration and to monitor the biological responses to hydromorphological changes, in order to reach the good ecological status or potential of rivers (REFORM 2015). To investigate and quantitatively assess the success of the applied river restoration measures, REFORM used different response variables, such as hydromorphological attributes, habitat composition of the river and its floodplain, aquatic- and floodplain-related organism groups (fish, invertebrates, floodplain vegetation, etc. ), and stable isotopes. For eight pairs of restored and unrestored reaches, however, the project team additionally applied the ES approach to estimate restoration success (Muhar et al. 2016). Provisioning (agricultural products, wood, infiltrated drinking water), regulating (flooding, nutrient retention, carbon sequestration), and cultural (recreational hunting and fishing, kayaking, biodiversity conservation, appreciation of scenic landscapes) services were quantified and monetized by means of locally available data and literature, by conducting surveys among inhabitants and visitors and by using a selection of economic methods (e.g., market value, willingness-to-pay survey). Afterward, the resulting numbers were summed up to provide an estimate of annual economic ecosystem service value, normalized per area (Vermaat et al. 2015). The authors of this study acknowledge that a monetary quantification of ES may not depict the fullness and diversity of societal appreciation (Westman 1977). Nevertheless they used this approach because it enables the comparison and evaluation of trade-offs and provides tangible information that is understandable for the general public and policy-makers (Vermaat et al. 2015). The results of the analysis show that river restoration indeed enhances overall societal benefits. The restored reaches and their floodplains provided significantly higher service delivery and higher total value than the paired, unrestored reaches did (Vermaat et al. 2015). One of the largest river restoration projects in Europe is currently being carried out in North Rhine-Westphalia, Germany with a total budget of 4.5 billion Euros (RWI 2013). The Emscher River is a tributary of the River Rhine. Its river system drains the Ruhr region, and its catchment of around 865 km2 is home to some 2.5 million inhabitants. Thus, it plays an important role for economy and recreation in the area (Busch et al. 2001). As with most other rivers in Europe, it has experienced major alterations during industrialization since the beginning of the nineteenth century. The Emscher system was transformed into a system of concrete sewage channels due to straightening, embankment, and sewage discharge (Gerner et al. 2015; EG/LV 2015; Sommerhäuser and Gerner 2015; Winking et al. 2014). A 30-year project to restore the river system was started in the 1990s. The restoration measures include the construction of four decentralized sewage plants and 400 km of new, separated sewers, as well as restructuring of 350 river km in order to obtain a near-natural state (Sommerhäuser and Gerner 2015). Even though the project is still ongoing, the benefits from several ecosystem services, such as biodiversity, climate regulation, water quality, flood retention, recreation, and regional attractiveness, have already been recognized. Since the 1990s, the flood retention area has doubled, and a substantial increase of plant and aquatic macroinvertebrate species was measured. The increase of green areas (around 1 km2) improves climate regulation in the urban area. Additionally, the creation of 120 km of bike and walk ways strongly contributes to the enhancement of the region’s attractiveness and educational value as well as to the increase of its monetary value (Sommerhäuser and Gerner 2015). Besides the direct effects of the restoration results, the construction measures themselves have to be considered. A study from 2013 revealed vast socioeconomic effects from the project’s implementation. On average, the project directly creates or saves 1400 jobs per year, resulting in 41,554 person-years of useful work. According to the study, the numbers are even higher (109,787 person-years and 3700 jobs/year) when including indirectly connected production and employment effects. Additionally, the project generates tax incomes for the municipalities (around 50 m. Euros), federal states (around 91 m. Euros), and the German state (around 1.1 bn. Euros) over the whole project period (RWI 2013). The effect of the restoration activities on ES in this case study is specifically investigated within the frame of the “DESSIN” project (IWW Water Centre 2014) that aims to demonstrate a methodology for the valuation of ES. Besides its potential applicability for assessment and communication purposes, the ES approach can be used to address different perspectives toward river landscapes. Based on this consideration, the ES concept was applied in three study cases in Austria as a basis to investigate people’s perceptions of the availability and importance of various services provided by near-natural, restored, and degraded river landscapes. The focus lay on stakeholders with a certain decision-making competency and recreational river users in the case studies of the Enns and Drau rivers (Böck et al. 2013). In the third case study, the river Traisen, the focus lay on children and young adults (Poppe et al. 2015). The results of the semiquantitative questionnaire-based surveys revealed that in all three case study surveys, participants perceived cultural and supporting services the highest. In the Enns and Drau river case studies, survey participants regarded nature experience, recreation, and tourism as well as recreational fishery and water sports as specifically relevant (Böck et al. 2013). The surveyed young adults in the Traisen river case study most often associated structural elements, such as water or stones, with cultural functions, e.g., recreation possibilities within the river landscape. Similar to the first two case studies, they regarded cultural, regulating, and supporting services—specifically room for free movement, restfulness, and reduction of pollutants—as highly important (Poppe et al. 2015). All three case studies applied a strong focus on nonmonetary river landscape uses. This contrasts with the limited consideration of these services in practice in the formulation and application of policy. There, provisioning services tend to be given priority as they can be quantified and evaluated more easily and are therefore better comparable with economic values like jobs and property values. The results of the investigations shall contribute to gaining a comprehensive view of river landscapes and thereby improving future restoration planning and management. The insights into people’s perceptions have the potential to foster awareness for the importance of conserving a wide range of different river ES and assist in estimating future educational needs. The ES concept has the potential to contribute to already available management approaches. Its integration can help to support the evaluation of policy impacts, e.g., through the application of combined quantitative and qualitative valuation approaches. Its implementation into existing policy frameworks is discussed by several authors (e.g., Wallis et al. 2011; Vlachopoulou et al. 2014) and has the potential to be an added value in future decision-making processes. The clear linkage between the WFD and its principles and the ecosystem approach is also shown by Vlachopoulou et al. (2014). They argue that it has the potential to act in a complementary way. It could, for instance, be applied for the evaluation of different management scenarios and thereby support decision-making processes. In particular, the more holistic management approaches that are supported by the ES approach, such as the spatial mapping of ES or the comprehensive evaluation of multiple benefits, can potentially assist in achieving the goals of the WFD (Vlachopoulou et al. 2014). In this context, Koundouri et al. (2015) propose an integrated methodology that regards the ES approach as the core aspect to achieve a more sustainable and efficient water management. It combines the ES framework with traditional economic frameworks and consists of a socioeconomic characterization of the river basin area, an assessment of water use costs that are recovered, and a suggestion for appropriate measures for sustainable water management. In order to enhance the WFD implementation, Reyjol et al. (2014) established a list of research needs that also includes the reinforcement of the knowledge on relationships between good ecological status, biodiversity, and ES. They recommend enhancing understanding of ecological processes through developing further research on the links between good ecological status, biodiversity, and ecosystem functioning. As the ES concept is still not very well known among water policy-makers and managers, they point to the need for easily comprehensible guidelines for these actor groups. In 2011 the European Commission adopted the “Biodiversity Strategy to 2020” aiming to “halt the loss of biodiversity and the degradation of ES in the EU by 2020 and restore them in so far as feasible, while stepping up the EU contribution to averting global biodiversity loss” (European Commission 2015). Besides the first target of creating a habitat network by ensuring the implementation of the Birds and Habitat Directive, the second target of the strategy specifically addresses the protection and restoration of ecosystems and their services, since it is assumed that the restoration of ecosystems goes hand in hand with the protection and provision of ES. More specifically, Action 5 of the strategy recommends to “assess the state of ecosystems and their services in their national territory by 2014, assess the economic value of such services, and promote the integration of these values into accounting and reporting systems at EU and national level by 2020” (European Commission 2011). For fulfilling these aims, the working group “Mapping and Assessment of Ecosystems and their Services” (MAES) was established and delivered an approach for mapping and assessment of ES. In a technical report from 2014, the working group stresses that several conceptual issues regarding ES remain unexplained and that the links between biodiversity, ecosystem functioning, and the provision of ES are still not well understood (Maes et al. 2014). A midterm review of the Biodiversity Strategy to 2020 states that since the strategy was adopted, some local improvements have been made in terms of ecosystem restoration but at a rate so low that it leads to further ecosystem degradation and loss of ES. Human pressures on freshwater systems and other ecosystems remain unfavorably high, such that high impacts on biodiversity in freshwater systems persist. However, some important enhancements in the knowledge base have been made, and the collected data of assessed and mapped ecosystem and related services will be available for the support of decision-makers and private stakeholders in planning processes (European Commission 2015). Despite the aforementioned limitations and the fact that the ES concept has not yet “taken off” in river landscape management practice, it has the potential to raise awareness in society in general and for administrative actors and political representatives in particular (Böck et al. 2015). It could help to improve societal and political acceptance of river restoration projects (Vermaat et al. 2015) and serve as a tool to improve environmental communication and education (Böck et al. 2015; Rewitzer et al. 2014). 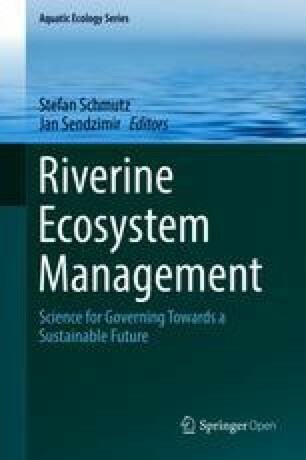 Due to its integrative character, actors in river landscape management also regarded the ES concept as a valuable support for planning and decision-making processes (Böck et al. 2015). For landscape planning processes, Kienast (2010) stresses conceptually strong points of the ES concept, such as the systematic approach of determining services and interdisciplinary, holistic approaches to supporting decisions based on integrating values generated from different perspectives (see Chap. 16). A major benefit from the application of the ES concept can be gained through its integration into ongoing programs, tools, processes, and policies. Through the recognition and quantification of ecosystems’ benefits for society, they are no longer deemed as worthless in decision-making processes (Everard 2009). On the contrary, the worth of ES will be increasingly recognized as society begins to decarbonize our economies to mitigate the impacts of climate change. This will involve lowering or eliminating the use of fossil fuels, whose services were used to substitute for the loss of ES over the past two centuries. Increasing acknowledgement of the vital role that ES play in the functioning of river social-ecological systems will be formalized not only in policy but in practice. This transition will be challenging, if only for its novelty, but earlier incorporation of ES into our economic and political practice will make it easier.